Using FCC 477 data, we created a visualization of relevant data. 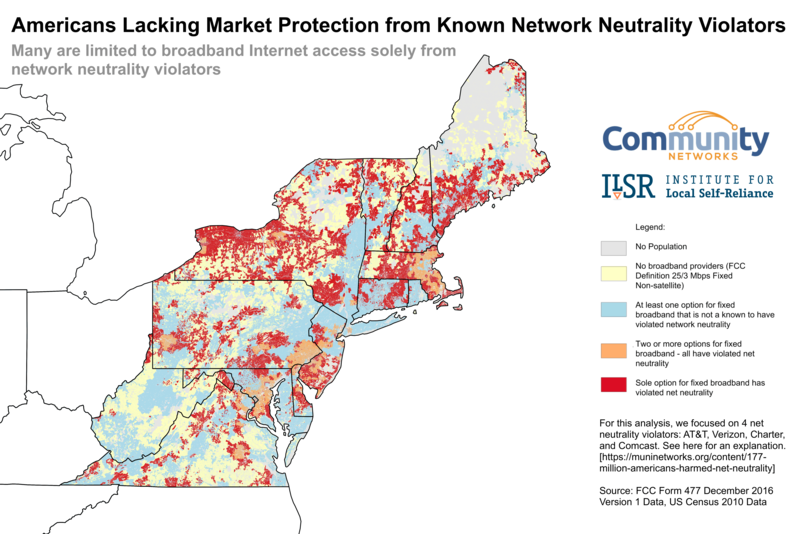 This map focuses on the people and businesses at greatest risk – where they are limited to options from providers that have violated network neutrality in the past or have admitted the plans to violate it in the future. In locations where subscribers have the benefit of limited competition, the situation isn’t much better. Among the 146 million Americans with the ability to choose between two providers, 48 million Americans must choose between two companies that have a record of violating network neutrality. Look at the East Coast, where the problem is particularly bad, except for maybe NYC, where we did not include Altice, which recently purchased Cablevision. We did not feel that we had enough evidence of its history to include it as a past violator. From Virgina to Maine, there are 74 million Americans. Nearly 15 million will soon be limited to a single broadband provider that has already violated network neutrality. 15.5 million can only choose between 2 providers that both violated net neutrality. Another 3 million have no broadband Internet access available. California has a total population of 39 million. 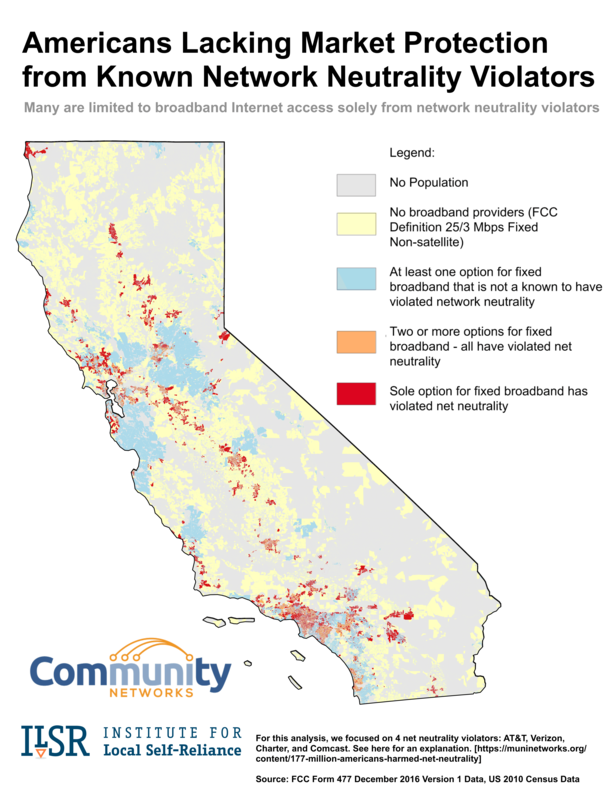 10 million Californians have no choice for broadband except for a single company known to have violated network neutrality. 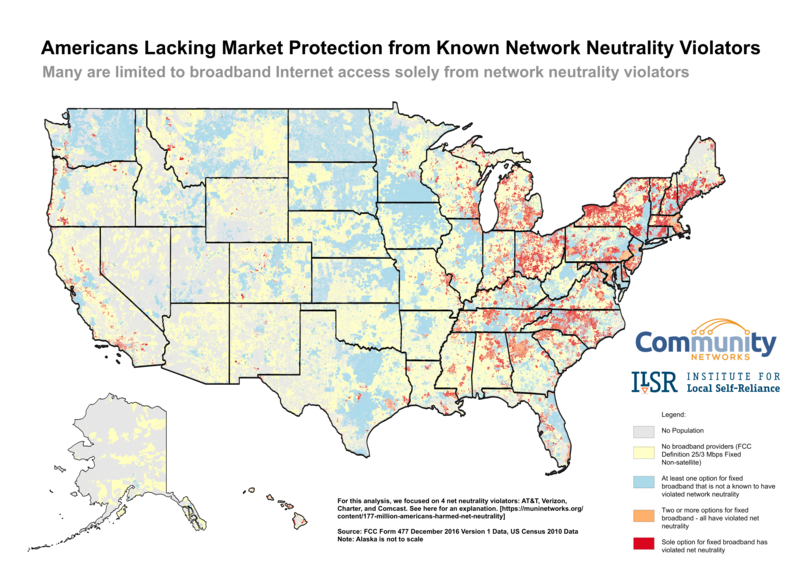 Another 9.5 million have two options for broadband Internet access but both have violated network neutrality. 2 million people have no broadband access. When the FCC repeals network neutrality, the 129 million Americans with no choice in providers will join the 48 million with a choice solely between past violators and another 29 million Americans lacking broadband altogether to total 206 million Americans who have been abandoned to the whims of massive cable and telephone monopolies. In 10 years of working with community-based providers and small ISPs, we have only seen one thing that encourages more investment from the monopoly ISPs: competition. Removing network neutrality protections will enable these large firms to increase their margin without investing in new services, leading to less investment for the least connected. It will decrease investment and competition in that sense. But as firms like AT&T cut deals with other monopolies, expect AT&T’s ISP rivals to face more barriers to their own success, leading to more consolidation and less overall investment. These are the trends a rational person should expect following FCC Chairman Pai’s holiday gifts to the biggest ISPs. Not all of these violations are necessarily specifically violations of network neutrality as defined in the 2015 FCC Order. But they all demonstrate the obvious motivation of monopoly-minded firms to maximize short-term revenue by setting up virtual tollbooths. Some smaller firms may also engage in violating network neutrality, though for different reasons. Smaller firms are unlikely to be able to extort payments from Netflix, for instance, but they can exert pressure on their users to avoid needed upgrades. In short, there is more than enough evidence to be supremely concerned about impact of the FCC’s looming decision to repeal network neutrality. Particularly where people are captive to large monopolistic companies. 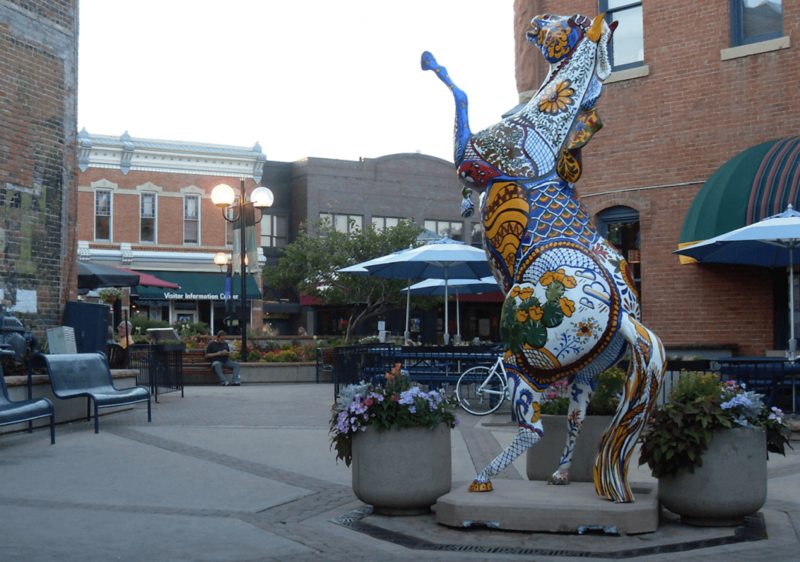 A final note on the underlying data – because the FCC data is collected at the census block level, these numbers almost certainly understate the scale of the problem. 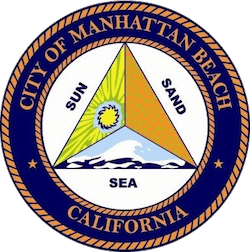 A census block may be divided between two non-overlapping providers, resulting in the claim that it is competitive despite all inhabitants only having a single option. Similarly, a census block may be only partially served in reality despite official government records indicating all inhabitants have broadband access. Thanks to H. Trostle and Christopher Barich for the research and mapping behind this analysis.